Tuesday's This is the Day Guest was Grace Before Meals host Father Leo Patalinghug. He shared with us that he was recently challenged to a throwdown with Food Network star Bobby Flay! He couldn't tell us who won but Father Leo is a winner in our book! 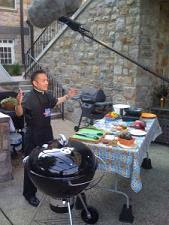 Check out Father Leo's website www.gracebeforemeals.com for tips on ways to connect with friends and family at the table AND to find out when his throwdown challenge will air. Come to think of it, Father Reed cooked with Father Leo, maybe Bobby Flay will be in Watertown soon.